I love soup. Period. It is one of my go-to meals during the cold winter months (probably because it warms me right up). I make a big pot of it early in the week and then enjoy it for lunch and dinner over the next few days. I’ll also usually have enough to freeze for later. 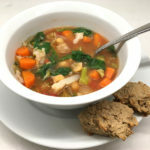 If you’re a fan of Dr. Fuhrman’s Eat to Live (plant based, nutritarian diet), then you know the right soups can be full of nutrients and provide a well-rounded meal. This is a recipe for one of my all-time favorite soups. I’ve been making it for years and have been tweaking it with every pot I cook. It’s very veggie-ful (hence the name), and it’s so easy to make. It’s also considered an Eat to Live friendly recipe, however there are potatoes in it, and Dr. Fuhrman recommends limiting cooked starchy vegetables to one cup per day, so just keep that in mind as you enjoy. Otherwise, go ahead and indulge in a bowl (or two … maybe three) of this healthy comfort food. Chop onion and slice celery into bite-sized pieces. Peel and mince garlic cloves. In a large pot over medium heat, add a small amount of broth (enough cover the bottom of the pot) and sauté onion, celery and garlic for a few minutes. Peel and slice/chop carrots and wash and chop potatoes. Add the rest of the broth to the pot and throw in carrots and potatoes. Drain tomatoes and stir into pot along with 2 to 3 tablespoons of Mrs. Dash Garlic & Herb Seasoning. Turn heat down to medium-low, cover and cook for about 20-30 minutes, or until carrots and potatoes are just soft. Meanwhile, wash and chop the broccoli and cauliflower into bite-sized pieces, and drain and rinse chick peas. When carrots and potatoes are ready, add broccoli, cauliflower and chick peas to pot and cover and cook for about 10-15 minutes more. Note: You will probably need to add extra water to the pot. I just eyeball the amount. You don’t want your soup to be watery, but you do want to be sure there’s enough broth with your veggies. Taste your soup and season with more Mrs. Dash, salt and pepper as needed. Just before serving, stir in fresh spinach until it’s wilted (I do this with each bowl I serve rather than mixing it into the entire pot). 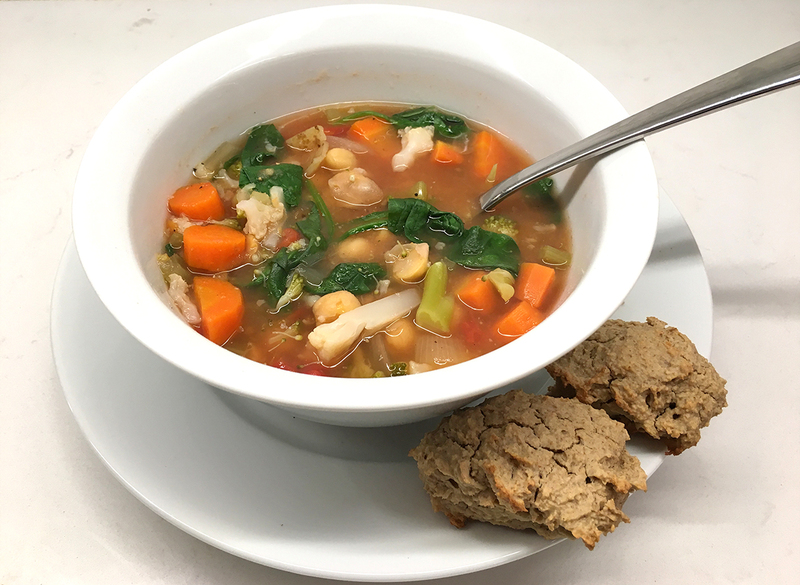 Serve soup with homemade gluten-free oat biscuits. Based on the shoreline of Connecticut, I'm all about healthy living, traveling, beauty, home and more.